This Country is a new mockumentary series about the life of teenagers in modern rural Britain. Written by siblings Daisy May and Charlie Cooper, this is a comedy that feels like light viewing, yet has somewhat of a cleverly undertone of despair. Our protagonists, teenagers Kerry and Kurtan (Daisy and Charlie Cooper) are restricted by the monotony of life in this small Cotswolds village, taking their frustrations out on one another. They are rebellious and despondent in ways that an angsty teenager of thirteen or fourteen may be, yet it feels like Kerry and Kurtan are getting to this stage quite a few years late. All the people they grew up with have left the village; there is nothing for them there anymore. But this pair are reluctant to make a leap of faith and change their lifestyles, which leaves them stagnant in a place where nothing happens and pointless feuds take priority over genuine life aspirations, whether that be the result of highly competitive scarecrow competitions or arguments about who gets to use the oven next. But This Country is not merely the embodiment of troublemaking child’s play; there are serious issues being tackled here as well. During this first series Kerry and Kurtan’s uncle gets released from prison, only to reoffend the same day; Kerry’s dad gets accused of being a Peeping Tom; and both teenagers must question whether either of them are able to forge successful careers for themselves inside or outside of the village. There is a similarly unbearable undertone of melancholy and unrealised ambition as that of Britain’s flagship mockumentary: The Office, with this obscure feeling of discontentment becoming more deeply imprinted in the viewer’s mind as the series progresses. Despite their complaints, there is a strong bond between our two protagonists, which gives the whole programme some heart (so much so that all other characters seem to fade into irrelevance). Though it may seem easy to feel repulsed by the characters, with viewers possibly feeling they too need to escape the predicament Kerry and Kurtan find themselves in, This Country quickly becomes a compelling, if stifling, watch. This Country expertly leaves certain things unsaid, creating an interestingly discomforting mood. Here is a thoughtful and stimulating satire, and while it’s a no brainer that fans of The Office should give This Country a go, it is certainly a comedy with a wide-reaching demographic, with frequent laugh out loud moments. I, for one, never thought I’d laugh out loud at the word ‘Tomato’. Comedy Circle #2 Why Do I Keep Laughing At Terrible Things? We live in a world where vile things have coexisted with, and been caused by, us for as long as humans have lived. Maybe horrific events are as frequent and as constant as they ever have been, but our exposure to them is arguably greater than ever before due to our heightened internet and media accessibility. It’s getting hard to avoid hearing about and seeing bloodshed on all corners of the globe, and rightly so. The suffering of others shouldn’t be something we are allowed to ignore. But with our ever-increasing knowledge of what really goes on in the world outside of our homes comes an overwhelming sense of hopelessness, fear and frustration at the inevitability of more depravity to come. So how is it that we deal with such feelings? For many people, myself included, the first place to turn is comedy. The horrifying terror attacks in Paris just over a month ago shocked and sobered the majority of us. Nobody worth the time of day is finding humour in the death of innocent citizens. However, it is often suggested that the most effective way of conquering the threat of terrorism lies not in force or violence, but in laughter of a strange kind; in ridicule. There is no element of this tragedy that is to be found funny but it has, yet again, got me thinking about how our opinions are shaped by what we view on television and how exactly we are expected to process this onslaught of information. It can be claimed that the truth lies in the ridiculousness of it all. To laugh at something does, after all, disarm the thing that we are laughing at, rendering it inconsequential. Every waking moment revolves around the concept of death, regardless of whether we are aware of it or not. Everything in life essentially boils down to death but it seems, for the most fortunate of us, to be something we hear more about in the media than ever personally experience. Being eighteen, I have had limited encounters with the ill and the dying and that has left these concepts to be very abstract and distant in my daily life. My dog died unexpectedly at the beginning of November. I didn’t see her dead or even nearly dead and it felt strange to have her be there and then suddenly not be there anymore. Every time I talk about the fact my dog is dead, I laugh. My instinct now is to back this up by insisting that there is nothing funny about the fact my dog is dead, but if that was the case, surely I wouldn’t be laughing? Laughter is perhaps our most relied-upon social tool, used to ensure a connection with others through the assurance that our communication is effective and our conversation understood. Laughing is also a means of deflecting stress and processing grief. It works as a defence mechanism when we feel uncomfortable or appears as a symptom of shock or fear. We also laugh when we feel connected within a community due to holding a common belief; it seems that we find humour in the good and the bad. I may, perhaps, view this topic from a biased perspective: I am, after all, a British citizen and we are particularly known for our droll humour. So is that why I haven’t been able to cry; because I am British? Regardless of why we do it, it’s okay to laugh at things by way of processing information. Yes, it is often seen as socially inappropriate, but to laugh does not mean to laugh at something or someone. Perhaps it is the healthiest means we have by which to understand and digest the never-ending stream of atrocities we hear about in the news and maybe, as a result, it can become our lifeline. I won’t be seeing my dog again but I will continue to laugh at the fact she was an absolute moron. Everybody in Britain is well aware that there is a general election this week. At a time like this, it becomes increasingly difficult to avoid hearing and talking about politics. Yes, it’s depressing (well it is for me anyway, only accentuated by the fact I narrowly miss out on the chance to vote as I’m not eighteen until later in the year). But when something as important and inevitably dull as an election comes around, at least we are given something to help us make sense of it all, to vent our frustrations and to bring humour back into our daily lives. When times get tough, comedy takes a more prominent role in society. In 2015, we are experiencing a period rife with satirical comedy. Newzoids has frequently been compared to Spitting Image, which seems fair as satirical puppetry isn’t something you see everyday (though many, no doubt, may wish it was). Spitting Image may just have been one of the most important comedy shows ever created, as it allowed the power to be placed back into the hands of those creating the programme; straight back into the hands of the public. But the last episode of Spitting Image aired in 1996 and there certainly is a gap that has never quite been filled. For all its similarities, I can’t help but feel that Newzoids is not the programme to fill the gap that Spitting Image left. There were elements that I really enjoyed, particularly the darker political material such as the UKIP song but there were frequent, and somewhat predictable, pop culture references. Plus, the puppets were nowhere near ugly enough. But that’s not to say that this new show doesn’t have promise or that I didn’t laugh out loud in places. The voices behind the characters should be familiar to us by now (Jon Culshaw and Debra Stephenson are responsible for a large proportion of them), and they are brilliant, as can be expected of such a talented cast. 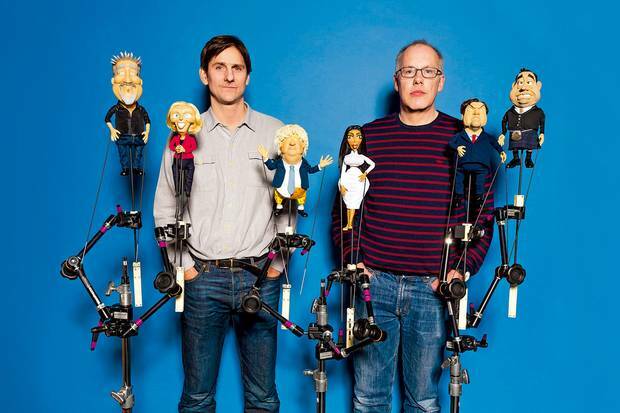 In order to be topical, each episode of Newzoids is created days, and often mere hours, before broadcast (just like Spitting Image did back in the 80’s and 90’s). In this sense, there is an excitement factor as here we have a comedy that is able to cover immediately topical material, but, for once, it isn’t a panel show. There is undoubtedly an extensive amount of work that goes into the making of such a programme, and I appreciate that, but for my tastes, I would like to see a much darker satire (though this has been able to build over time as the format has been cemented). Perhaps what I really need is to go back and watch some more of Spitting Image. Ballot Monkeys takes an interesting perspective on the election as it follows various parliamentary candidates during the last weeks of their campaigns. With all scenes taking part inside the party buses, there is little to observe other than the people themselves, so we are given a stripped back representation of each party and their candidates. The results are strikingly accurate, with frequent digs and frequent laughs. Like Newzoids, this programme is filmed as close to broadcast as possible, often on the same day, which enables the material to remain relevant and limits the possibility of stale caricaturing that could sneak in if writers become complacent. 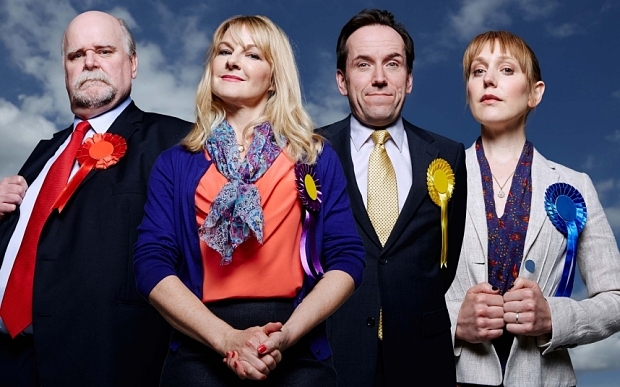 The cast is saturated with talent, with Ben Miller playing a Lib Dem campaign co-ordinator, Hugh Dennis as the Tory Deputy Campaign Manager and Sarah Hadland as a UKIP office support manager. The characters are diverse, with major and minor roles within the party covered by the likes of Uncle‘s Daisy Haggard and Esther Smith and Theo Barklem-Biggs (Crims). Andy Hamilton and Guy Jenkin have skilfully incorporated criticisms of politicians and our society in general such as the fact nobody in the Conservative bus listens to the female members of the team when they have something important to say. In my opinion, creating and appreciating political comedy is vital in today’s society, so the response to this year’s election truly delights me and I hope the humour outlasts the politicians.